rec. Konzerthalle "C P E Bach" Frankfurt, 2010/13. The music of Breslau-born, Leipzig-educated Jadassohn is not totally unfamiliar. There are reviews here of his First Symphony, Serenade and Piano Concerto No. 1 as recorded by Cameo and of the two piano concertos from Hyperion. Toccata and Querstand have weighed in on behalf of his chamber music. It can fairly be said from this that his music is of good report and this very logical double from CPO underscores that appraisal. He has a sure-footed melodic gift and his orchestration is sleek and memorable. That is obvious from his remarkably concise First Symphony which has the punch and the flight-feathers of Schumann's Fourth Symphony. It's an extremely enjoyable work that you will want to hear again straightaway. The playing and the sound, as with the rest of the set, is a delight. All those sprinting strings could so easily have sounded shrill but the CPO team, and more to the point Griffiths' Frankfurt orchestra, present themselves as yielding and aureate. Speaking of which the delightful Cavatine op. 69 could easily have been by Brahms - the middle movement of some lost violin concerto. As for the other Cavatine (cello) this is a warm genre piece. It would go well with an inglenook and a blazing fire on a November's day. It merits a place alongside the short works for cello and orchestra by Dvořák, Bridge and Tchaikovsky. The other three symphonies run to around the half-hour mark. The Second again metaphorically doffs a respectful and enthusiastic hat in the direction of Robert Schumann. Jadassohn keeps the ideas coming fresh and pleasing but always within the channels of Schumann's idiom. There is passion there too, of the type you can hear in the first movement of Parry's glorious First Symphony or in Sullivan's Symphony. On disc 2 we start with the Third Symphony, which is only let down by a leaden-footed fugal Menuetto. Otherwise Jadassohn continues to explore the Schumann style. The Fourth Symphony still has those rushing and scurrying Schumann-isms but the craftsmanship is polished and meets a gift for agreeable melodic invention. By the way Jadassohn's pupils included Chadwick, Delius, Grieg, Busoni, Reznicek, Weingartner and Karg-Elert. The two discs are presented elegantly in a single-width case. The lengthy and useful liner note by Franz Groborz helpfully limns in the details of the composer, these works and their background. Of the generation after Schumann, Jadassohn is clearly creatively indebted to that composer. 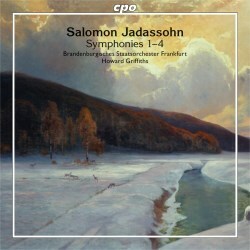 If you enjoy Schumann you will like Jadassohn. His fall from grace was perhaps down to his failure to shake off the influence of others. This was consolidated in 1930s and 1940s Nazi Germany by his being Jewish. None of this need hold us back from enjoying the music now or for that matter the music of his contemporaries Reinecke, Volkmann and Gernsheim. The performances in this case are forward and eager; not in the least academically reticent. The photograph on the back of the booklet shows Howard Griffiths conducting sums up what we hear in these performances; all smiling dynamism. Smile that we still have such music to discover and revel in.